Most British records are from England south of Lincolnshire but there are old records from Scotland and northern England, which may refer to A. sturmi, the two species being confused in the past. It is widespread in western and central Europe, but in Scandinavia it has only been recorded from Sweden, where it is included in their Red List (Gardenfors 2000). Deciduous woodland. 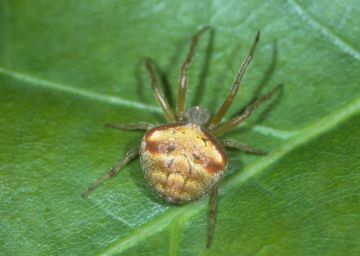 In contrast to Araneus sturmi the orb webs of this species are usually constructed on broad-leaved trees and shrubs, especially oak Quercus. Adults of both sexes are found from early to mid-summer, with some females surviving through to late summer. Loss of broadleaved woodland and scrub due to urban and agricultural development. Ensure woodland and scrub habitats are protected from destruction for development.